A shark that was tagged more than 10 years ago has been recaptured just 12 miles from its original location. 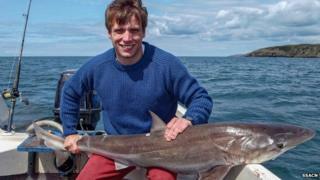 The tope was caught in Luce Bay in Dumfries and Galloway as part of the Scottish Shark Tagging Programme. It was at liberty for 3,716 days - a new record for the project run by the Scottish Sea Angling Conservation Network. Experts believe it may have swum more than 30,000 miles during that time. The species make their annual migration to areas such as the Bay of Biscay and the Azores after spending the summer in Scottish waters. A spokesman for the network said: "Recaptures, especially after long periods at liberty, clearly show the benefit of SSACN's tagging programme and the long term commitment of our volunteer 'citizen scientist' sea anglers." The fish put on 8lbs (3.6kg) between captures and now weighs 46lbs (20.8kg) - close to the maximum size for a male tope. It was returned to the sea unharmed, the spokesman said.